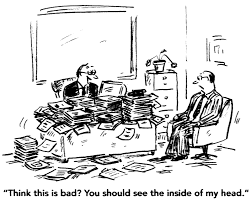 A cluttered desk is not the sign of a brilliant mind. The calendar says March so hopefully spring is right around the corner. March brings spring showers, the luck of the Irish and an opportunity to declutter your space (many believe that by decluttering your space – you permit new ideas and opportunities to enter). We get so caught up in our day-to-day activities: job, home, kids, after hours events – that we do not take the time to re-organize and sanitize our spaces. So let’s start at work, it’s not just decluttering our desk but being respectful and professional too. Refrain from gossip: If you are interested in developing meaningful, trusting relationships, then steer clear of office gossip. Getting caught up in petty gossip makes you look unprofessional and two-faced. Walk away and take the high road. Never, ever talk about salary: Salary is a taboo topic that shouldn’t be discussed with anyone but HR and your boss. Act professional at all times: This includes cyper professionalism-never, ever Facebook or tweet negative things about work or anyone from work. Save social networking for home: There’s a time and place to get on Facebook but it’s not at your work desk. Even if your company does not restrict use of these sites, you shouldn’t abuse this privilege. Mind your manners: This goes beyond saying please and thank you. It includes giving your undivided attention during meetings, answering emails promptly, respecting others time. Don’t forget to clean up after yourself. Look the part: You should always strive to look professional. Pay attention to detail, a stained shirt, scoffed/soiled shoes all say you don’t care about your personal brand. Perfect your communication skills and style: This is the cornerstone of professionalism-speaking and listening abilities, an aptitude for asking good questions and clear communication. Your cubicle DOES reflect you. We want you to be authentic, professional and YOU! Wishing you a sunny and successful spring! Need help organizing your space? No time? Please contact me today. Achoo! Workplace etiquette during flu season. Happy New Year! Here’s hoping that 2018 brings sunshine, new experiences and new friends into your world. As I am writing this blog, the sun is shining (yeah) and the temperature is rising – 12 degrees and rising (watch out- a heat wave)! Although we are expecting warmer temps this weekend, we all know that winter is not going away for a while yet – after all it is Columbus, Ohio. So….. with that in mind, thought it would be good to share some etiquette tips on good health as we are in the middle of a major flu epidemic. Congratulations if going to the gym to work out. Awesome that you are commited to taking better care of yourself. But please if you are not well, wipe down the equipment after you use it. A recent study revealed that over 2,000 different bacteria were discovered on a treadmill after a workout – yikes! Stay home! If you have flu-like symptoms, stay home for at least 24 hours after your fever is gone, recommends the CDC. Besides the fact that you’re minimizing the spread of germs, you’re getting the rest you need to get rid of the flu bug. Avoid sharing confined spaces with fellow employees, if there is a flu outbreak at your office. If you must have that meeting, suggest conducting it via the web instead of a small (confined) conference room. If you have to sneeze or cough, cover your nose and mouth with a tissue. Dispose of the tissue and wash (or sanitize) your hands immediately. Handkerchiefs are not sanitary, especially if you use them and then put them back into your purse or pocket for re-use later. If a tissue is not available, sneeze into your elbow rather than your bare hands. Avoid using your colleague’s computer, mouse, phone, pens or anything else that they would handle with their own hands. It’s more important than ever to wash your hands often. Scrub your hands with warm soapy water for at least 20 seconds. Germs can easily enter your system through your eyes, mouth and nose—any time of year, so it’s important to keep your hands away from your face. This can be a tough habit to break, but if you can train yourself to not touch anything above your neck, you will minimize your risk of getting sick. This goes without saying, but whenever you’re in a public place, make it a habit to wash your hands, often. Proper hand washing is the best way to reduce the spread of germs. Keep sanitizers handy – and use them. Wiping down the office hotspots – such as your keyboard, desktop and doorknobs –will kill those germs that are just waiting for you. Keep a spray bottle at your desk and a packet of wipes with you at all times. Wash your coffee cup with hot, soapy water. A quick rinse isn’t going to remove any contamination from germs floating around your office. Use disposable as opposed shared eating utensils, dishes and linens in the office kitchen. You never know quite how clean those re-used items are. Keep your distance! Limit your interactions with a coworker who comes to the office sick. A person who has the flu can pass it on to you as far as six feet away. Wishing you good health in 2018! Ready to stretch and go outside your comfort zone? Is your team struggling to step into leadership? 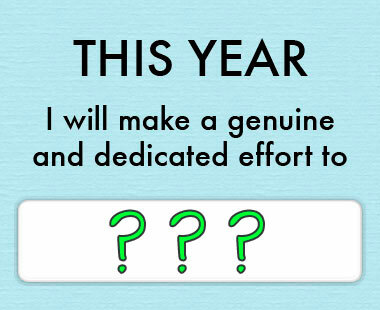 Is this the year you create an exciting new you? Please contact me directly for your complimentary private session to discuss your goals. With the holiday season fast approaching, I thought it would be a good time to do a quick refresher on social and business etiquette tips for the holiday party. Building a personal brand is NOT just about fashion and looking good. It is about allowing others to see your unique value and so much more. Don’t be caught off guard this season with a faux paux that could sabotage your success. Engage in positive, polite conversation. Refrain from negative comments, stick to positive topics. Ditch the smartphone. Give your undivided attention to your host and guests. Keep your social media posts in check. Ask your host for permission to post. Wear appropriate attire. Know before you go whether it is a cocktail party or full out dinner party – it shows respect. Never bring an extra guest without consulting first with your host. One drink please! Too much alcohol has caused many individuals embarrassment. Bring gifts. A simple thank you gift to your host/hostess is always appreciated. Give the gift of style, confidence and time. A gift certificate for personal shopping, closet evaluation, color analysis and/or make over is the gift that keeps on giving! Not enough hours in your day to do everything? This holiday season, let me help YOU with your shopping. You provide the names, requests, budget – I will do all the work. Contact me directly to arrange your holiday gift giving needs. Happy Thanksgiving – I am grateful for all of you! “A smile is a facelift that’s in everyone’s price range." Hope you are enjoying the warm weather and making time for family, friends and a little R & R. Summer is a wonderful excuse to perhaps a slow down a little bit - assess your goals, life purpose and be introspective. Many times in working with my clients we are so eager to transform the whole “head-to-toe” image that we forget some of the basics at our fingertips. Having a great smile is an inexpensive way to change your appearance. Many people think that weight loss or botox is the answer to an improvement in appearance, but that’s not all there is. If you think that your smile is not what it should be then visit your dentist to discuss how a smile can change your life. There are many inexpensive dental procedures that can add a glow to your face. You may not realize that it only needs a great smile to change how people view you. Crooked, stained or cracked teeth can turn people away from you. Improving the appearance of your teeth can draw them back. The most cost effective dental procedure on the market is in-office whitening when the dentist uses specially approved products placed on your teeth that bring about almost instant changes to your teeth. Just overnight, those newly whitened teeth will project your facial appearance far and wide and it will not cost you an arm or a leg either. Smiling not only affects your brain but also your body. Each time you smile you throw a feel good party in your brain (the act of smiling activates neural messaging that benefits your health). You are actually better looking when you smile. When you smile people treat you differently. You’re viewed as attractive, reliable, relaxed and sincere. It doesn’t cost you anything so SMILE. Are you ready to make your personal brand brighter? Special 10% off special on all services good thru 8/30/17. Call today to see how we can make you sparkle! It has been several months since you have heard from me – unfortunately major life events –knee replacement surgery, Mom’s passing- disrupted my life. We are back on track in 2017! 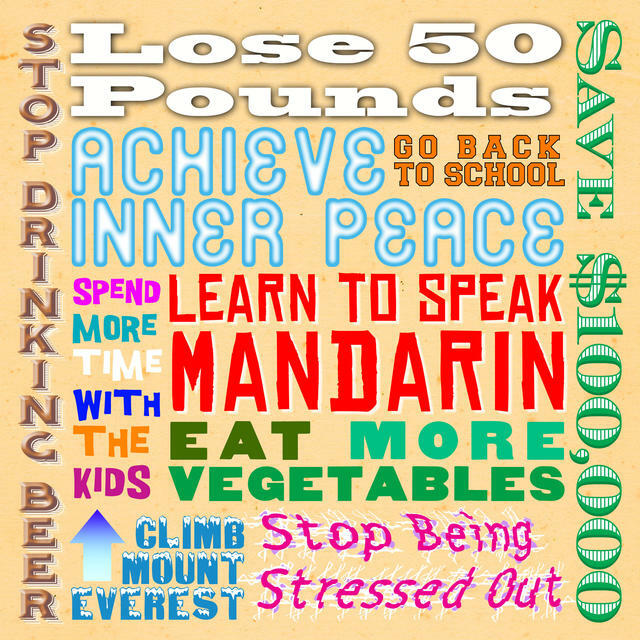 I have never been a big believer in New Year’s Resolutions. It always seemed pointless to have all these big goals knowing in your heart of hearts – it was unrealistic. Don’t get me wrong, setting goals are important and have a place in our lives but they need to be within our reach. If it is one thing I have learned, it’s managing your expectations. So just do ONE thing differently or in addition to your normal life. Perhaps it is just adding ONE walk around the block first thing each morning. Or limiting yourself to ONE glass of wine each night, or ONE sweet treat each day. It could even be donating ONE hour of your time to volunteer. The point is simply to make a small difference in your life. Most importantly whatever you do, be sure to do it consistently for 21 days – It will then become a part of your new “normal”. Last but not least – please share with me what it is you are doing and I will become your accountability partner. Plus it is always more fun to share what you are doing differently – don’t keep it to yourself! Summer has arrived with high humidity and soaring temperatures, so I thought it would be a good time to review basic guidelines for professional business attire. Every workplace has different dress code expectations but there are general rules of thumb that all employees should follow. Here are a few suggestions to keep your career on track and look professional and appropriate in the workplace. Achieve a more relaxed look in the summer by wearing lighter fabrics like cotton in creams and khakis. Don’t go too casual: shorts are never appropriate for the office as they look too laid back. Stay away from tank tops-if it looks like you are going to the beach, you don’t belong in the office. Do dress up: Summer dresses are flattering to women and keep you cool on sticky days. Choose light or bright colors and soft patterns. Don’t Under-Dress: Avoid spaghetti straps & strapless dresses (those that reveal too much skin). Be careful with your fabric choices too – not see through. Be sure bra straps are tucked in. This is a major distraction & makes you come off as messy and scattered. Remove sunglasses once you're indoors. Ladies -they are not a head band. Un-tucked shirts, jerseys or anything else that looks like you are going to a bar – biggest summer attire faux pas for men. Don’t bare it all: open backs, plunging necklines, rising hems are always inappropriate at work. Have fun with shoes: wedges & chunky heels are in this season. Open-toed shoes are acceptable as long as your feet are clean and manicured. Flip flops are NEVER appropriate for the office. When in doubt, don’t. If you think a piece of clothing could be inappropriate for the office it probably is. Dressing for your career is important no matter what the temperature is. It's always important to look professional and appropriate in the workplace. Inappropriate summer attire can be distractful, and can affect productivity and customer service. Be polished; warmer weather is not an excuse to dress like a slob. Not sure how to handle your company dress code? Need help grooming and transforming your staff into your company's best ambassadors? Call Shelley today! Does Your Workspace Reflect the Image You Want? A big ‘thank you” for all those that celebrated and supported my book launch to benefit Dress for Success. It was a delightful evening filled with good friends and family. 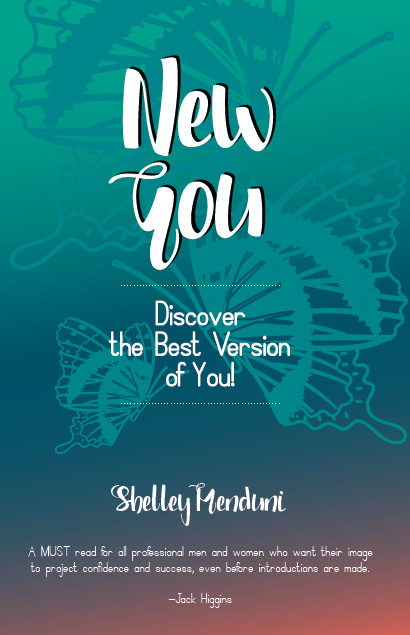 “New You: Discover the Best Version of You” now available for purchase on Amazon or on my website. Your workspace: a messy desk is not a sign of a brilliant mind. So to foster goodwill and success with your peers, be a conscientious good neighbor. It doesn’t hurt to greet your co-workers with a smile or extend a “please & thank you’ in the course of your busy day. Looking for creative and fun ways to bring civility into your workplace? Contact Shelley today to see how we can increase productivity, raise employee retention and generate a positive and engaging workplace for your organization. First an apology – you have not heard from me for several months because I am finalizing my first book. Yeah! Who knew it took so much time, effort and sweat equity? Please stay tuned for more exciting details to follow. Unlock your passion, and make killer presentations! Passion – what you care about most – is the core of authenticity. It’s the real deal and you have it. Somewhere under all the fear of public speaking, nasty restrictions -there’s a rock star inside of you. So whether you are in a small group situation or facing a large audience – you want to know where presentation power comes from? Passion. So tapping into your inner resources is your secret. We are not asking you to be a plastic version of you or someone else. Get rid of your fear of mistakes and dig into your personal power. Learn to tell a good story: frame your own in a compelling way, it’s a mix of data and narrative. Tell about a problem and show how to solve it. Have a strong professional presence: biggest mistake – moving your body too much. Standing still and using hand gestures for emphasis is the most effective. Make direct eye contact. Pick a few people in your group/audience that you pretend are friends. Posture, standing tall not only gives you confidence but projects your voice. When you are able to develop an emotional connection with your audience/group, they will understand that you care. You are not just spouting information but making a difference in their lives. That’s a great feeling. Unsure of how to tap into your passion? Private coaching may be the key to continue your journey to success. We can hone your skills and cultivate your professional presence. Contact Shelley today for your complimentary coaching appointment. Ok, we survived Halloween and now we know it will be a whirlwind for the holiday season. Before we get overwhelmed with the festivities, it is important to review some guidelines for etiquette in social workplace activities. Most companies today will offer some form of celebration, so to keep your career moving forward and perhaps to even give you a distinct advantage - let's review. Although it may be tempting to let loose after working hard all year long – think again. You have worked hard to build your career, according to many business etiquette experts, the cardinal rule is to remember that no matter how festive the occasion, it’s still about business. The following advice ensures a smooth & enjoyable event. 1. Eat, drink and be merry – in moderation. Remember alcohol plus you and your boss can equal a Monday morning “I can’t believe I said that”. 2. Dress appropriately for the occasion. This especially applies to women who sometimes use company parties to strut their stuff. Leave anything short, tight or revealing in the closet. You’ve worked hard to create a professional image and revealing clothes can alter your peers/employer perception of you as a competent professional. 3. Become visible to upper management. This may be the only time you see the president, CEO or VP in person. This is a great opportunity to become visible to the higher-ups. At the very least, don’t spend the entire evening with your regular office buddies. Mingle with people you don’t know. 4. Pay attention to the time you arrive and when you leave. Even if you really don’t want to attend, avoid arriving 20 minutes before the end just to make an appearance. Managers and coworkers will notice the error in judgment. 5. Be sure to thank those who coordinated the party. It takes a lot of time and effort to put things together for a party. Not only is saying thank you the nice thing to do, but it makes you stand out from the many individuals who don’t. With the holidays fast approaching, I would like to say “thank you” to each of you. Thank you for reading this blog, trusting me to help you discover and create a better version of YOU. It has been my privilege to work with many of you. What a difference you have made in my life – I LOVE what I do. It is so gratifying to watch many of you be transformed and start a new chapter in your lives. We are looking for ways to better serve you. Please take a moment and give us your feedback by answering a few short questions and receive a 10% savings on any future order. Happy Thanksgiving everyone and please remember me for creating the best version of YOU! Shhhhh! What are people saying behind your back? Executive Presence: The “It” Factor– do you have it?